During the upheavals of the English Revolution when the divine right of the English monarchy was challenged by Parliament, the king executed, and a Commonwealth under Cromwell instituted, there was vigorous debate about the kind of government which should be instituted. Thomas Hobbes (1588-1679) argued for a powerful absolute monarch ("The Leviathan") who could keep order and provide essential government services. 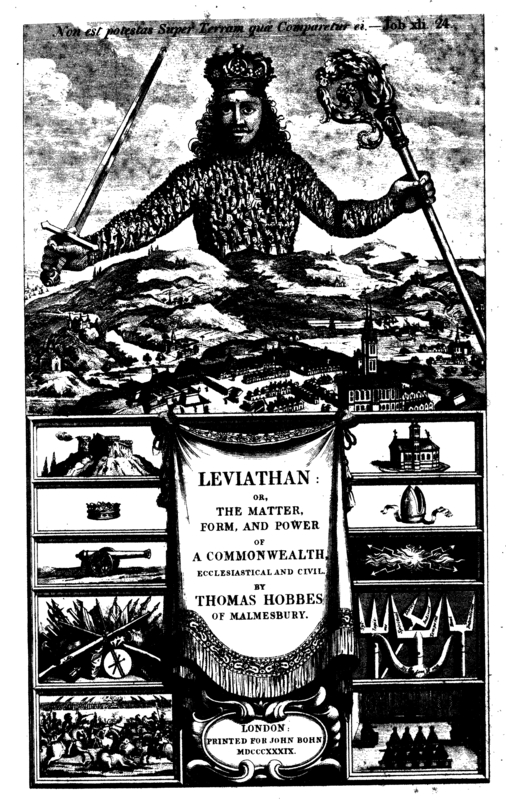 Above is the famous frontispiece of his book The Leviathan (1651) which shows the Leviathan (or the absolute monarch) wearing a crown and holding a sword (a symbol of military power) and a crosier (of religious power). His body is literally the “body politic” as it is made up of millions of his subjects. He is thus also literally the “head” of state. He stands above the two pillars of his power: the army (the column on the left) and the established church (on the right). These views were vigorously challenged by groups within the parliamentary army most notably by the so-called "Levellers" who were the first group to argue for the natural rights of individuals (especially property), religious toleration, and elected parliaments which were responsible to the people. 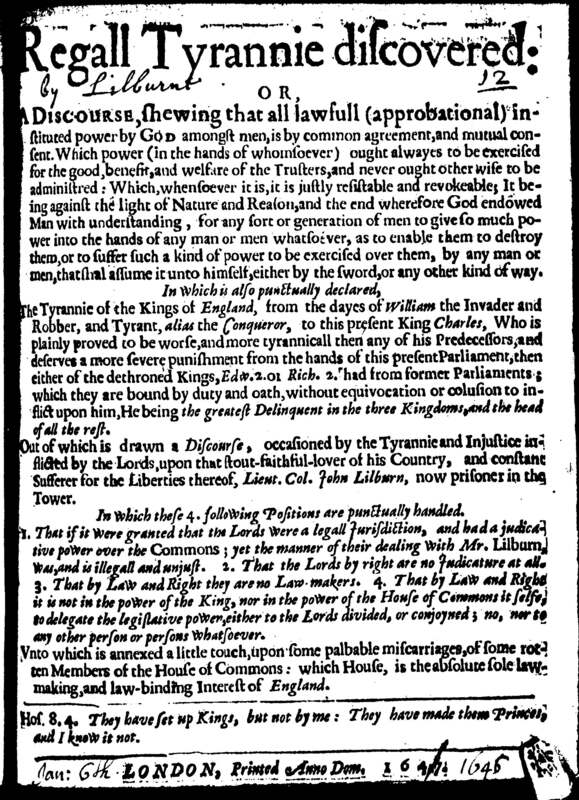 They briefly challenged the divine right of kings to rule before they were crushed by Oliver Cromwell, but their political theory lived on to influence later generations leading up to the American Revolution 140 years later.The lower image is the title page of a Leveller tract by John Lilburne, Regall Tyrannie Discovered (London, 1647). The title page is an excellent counterpoise to the Hobbes' title page because it literally rejects every principle advocated by Hobbes. Like many of the pamphlets produced during the revolution it was hastily composed and cheaply printed, often under cover to prevent the censors from seizing the copies before they were distributed. The author and printers had neither the money nor the skill to create well-designed title pages for their works. The best they could do was to use some inventive typesetting to arrange the paragraphs on the front page in interesting and artistic shapes. The tract is over 200 pages in length and Lilburne wanted to give a summary of his main arguments on the title page - hence the very lengthy "sub-title" (if you can call it that) in which he calls the king and parliament "delinquents", "ruffians," "invaders," "rotten members", and "tyrants." He had in mind exactly the kind of monarch which Hobbes depicted on his title page. On the left is the famous frontispiece to Thomas Hobbes, The Leviathan (1651). The book's motto was the Latin "Non est potestas Super Terram quae Comparetur ei" (There is no power on earth to be compared to him). The Leviathan (or the absolute monarch) is wearing a crown and holding a sword (a symbol of military power) and a crosier (of religious power). His body is literally the “body politic” as it is made up of millions of his subjects. He is thus also literally the “head” of state. He stands above the two pillars of his power: the army (the column on the left) and the established church (on the right). From top to bottom, the left shows symbols of the Army (a castle, a crown, cannon, weaponry, and battle); the right shows the corresponding symbols of the Church (a cathedral, a bishop’s mitre, excommunication, logic, and a religious court). There couldn't be a better depiction of the notion of "throne and altar" which formed the basis of state power in the 17th century. [an image from the Study Guide PDF which highlights important "Things "in the image].